*A limited number of partial scholarships are available for those in real financial need. Apply here. Mindfulness is a potent practice fostering equanimity and peace in an unsettled, noisy world. Unplugging mindfully helps reclaim those qualities of ease that can become diluted in the hectic whirl of our over-scheduled lives. At this fourth running of our popular homegrown Feathered Pipe Ranch retreat, we’ll explore the “power of the pause.” This is more than a yoga retreat or a ‘digital detox’: it’s a joyful week of mindful sensory awareness facilitated by accessible, breath-focused yoga and mindful movement, user-friendly meditation, as well as creative visual and sound sessions that make the most of our spacious Big Sky setting. 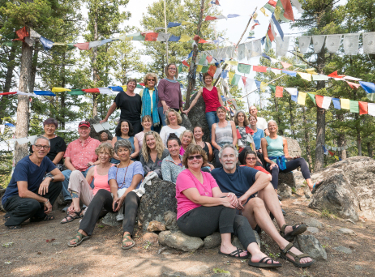 This retreat rekindles skills, practices, and attitudes that cultivate easier navigation of this often-challenging human incarnation and help you sketch your very own map for more mindful living. 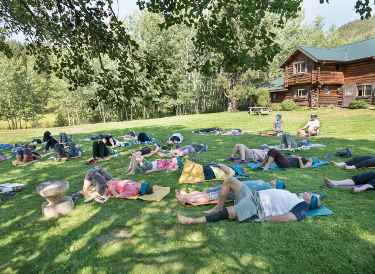 You’ll slow down and savor an unfiltered experience of the Rocky Mountain landscape and the storied Feathered Pipe Ranch — the place that our dear friend Erich Schiffmann calls his “favorite place on the planet.” No prior experience with any of the modalities we’ll explore during the week is needed. This is a retreat for anyone and for everyone, so come as you are to pause, breathe, move, see, harmonize, and sense your way back into ease. Our handpicked team of experienced guides offers practical, real-life skills to revive moment-to-moment awareness. We weave a calming balance of scheduled activities into stretches of unstructured time for you to settle into your natural rhythm. 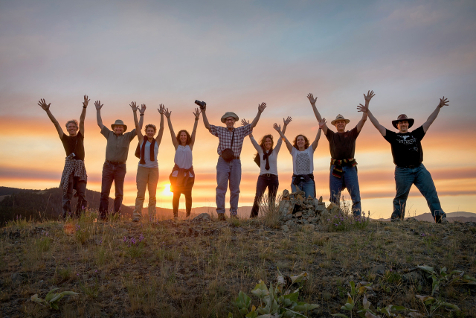 The intimate and uncrowded Ranch retreat venue — we host only one program at a time each week — offers as much opportunity for community as it does for solitude and personal space. Throughout, you’ll be surrounded by a scenic mountain locale, nourished by sumptuous fare, and cared for by our attentive staff. The week will include morning yoga, mindful movement and accessible meditation practice — all designed to help you establish or reinforce your own home practice — and afternoon sensory awareness sessions, book-ended by meditation. — One of these experiential gatherings will explore how different qualities of light, color, and gesture shape perception, and how such sensitivity can reawaken our moment-to-moment appreciation of our everyday world. Another will overlay the primary senses into a nature-infused lake and lawn experience, exploring how perception is rarely based on just one sense’s input. — Another set of gatherings — a first for The Mindful Unplug Experience — incorporates participatory sound, rhythm awareness, and voice practices, including an introduction to West African hand drumming. That introduction will culminate in a communal experience complete with drums. We’ll follow with simple, guided exercises to open and free the voice as a prelude to a song circle, featuring chants and songs gathered from our accomplished guide’s travels abroad and studies in World Music. Also on tap for the week: inspiring evening dharma talks, restorative practice before sleep, active listening to curated musical playlists, strolls to the nearby ridge on the continental divide, and more. Finally, our week together offers opportunities for mindful morning walks and an optional midweek off-Ranch nature excursion to relish more of Montana’s varied and stunning summer landscape. The Mindful Unplug Experience guides will be available for spontaneous sessions arising from interests and desires that emerge from the group — so don’t be shy about sharing your questions and insights as they arise! 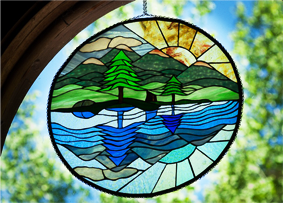 This retreat typically draws people of every age with a wide array of life histories and backgrounds; it’s an enchanting surprise to see what subjects unfold at each summer’s playful gathering. You’ll return home with new friends, groundwork for your own home practice, fresh sensory skills to navigate the outer world, and meaningful insights into your inner landscape. * 26 Yoga Alliance Continuing Education Program credit hours are available for this retreat. Learn more. “Loved it! Wonderful setting, great instructors, very relaxing, and easy to unplug. The teachers are wonderful, approachable, and kind. MINDFUL UNPLUG RETREAT TIP! Extend your time in peace and beauty while savoring Western hospitality by spending some time exploring the great West’s National Park treasures either before or after your Mindful Unplug week. Glacier National Park is a glorious and scenic 3.5 hour drive north and west of the Ranch, while Yellowstone is just a 4.5 hours drive south and east of the Ranch through some of the prettiest Western territory you’ll ever see. 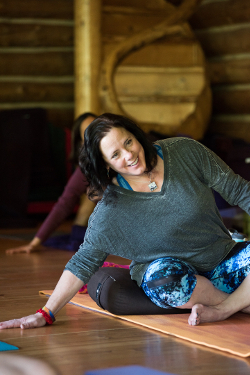 A Yoga-Alliance registered teacher (RYT 500) in Virginia, Anne teaches at Sun & Moon Yoga Studio, serves as President of the Feathered Pipe Foundation (she is the den mother and MC of the Mindful Unplug!) and works for busy startup companies. She knows what it’s like to yearn for practical ways to insert mindful pauses into a rat-race-y life. Her mission is to return you home with skills to plug back in consciously, stepping back into the world of noise and technology better equipped to nourish your own health. Anne’s teaching draws on inspiration from her most influential teachers: Erich Schiffmann, every fine poet, Hanuman, her cheeky teacher within, and the Feathered Pipe Ranch itself. Matthew Marsolek has received awards of excellence from the University of Montana for his musical work with theater and dance. He has studied East Indian and West African music for the past 18 years with a variety of teachers, including Mukesh Desai from India and Abdoul Doumbia from Mali, West Africa. Matthew has experience and training in jazz, classical, and Hindustani vocal technique and is also an accomplished jazz and classical guitarist. As a recording artist, he has released projects with Drum Brothers and Mandir as well as two solo recordings. A dedicated and charismatic educator, Matthew has a passion for rhythm, musical relationships, and the therapeutic and community building aspects of music. He teaches classes and clinics in voice, rhythm, and hand drumming throughout the United States and Canada. Annie Moyer conveys the authenticity and beauty of yoga in an accessible and inviting way. Dharma sessions with Annie demystify and share perennial truths from the teachings found in the world’s most enduring and beloved texts, such as the Bhagavad Gita. When she’s not teaching public classes or private yoga students, Annie’s working behind the scenes as director of Sun & Moon Yoga Studio in Virginia and as a mom to twin daughters. She was recently featured in a creative Yoga Anytime series exploring “Yogis Among Us,” leading students through creative sequences inspired by the likes of Jane Goodall, Harriet Tubman, Leo Tolstoy, and Maria Montessori. Amir owns Sun & Moon Yoga Studio in Northern Virginia. He works attentively with students seeking an enhanced quality of life through a plainspoken and sensible approach to health and well-being. He encourages taking the mindfulness of yoga practice into everyday life. His innovative techniques blend traditional Indian and Thai yoga influences with restorative postures, therapeutic applications, and somatic movement. Amir is an avid amateur hockey player, recently fulfilled a lifelong dream to design and build his own custom home, and is also known to herd cats. *Invite a friend(s) new to the Feathered Pipe and you both save $100! Shuttle Service: Airport shuttle service to and from the Ranch on arrival and departure days is an additional $65. Shuttle service on days other than arrival/departure is $100. Arrival and departure: Please plan to arrive at the Ranch no later than 5pm on the arrival day (Saturday, 13 July) of your retreat so you can join us for a tour of the grounds before dinner at 6:30pm and our group evening orientation following dinner. Please arrange to leave the Ranch in the morning or early afternoon of departure day (Saturday, 20 July). There are no classes or sessions on departure day. We request that our guests depart their lodging by 9am on departure day to give our staff sufficient time to prepare for incoming guests. Interested, but still need more information? Visit our FAQ page, drop us a message including your contact details here, or give us a ring at (406) 442-8196.